TAMPA, Fla. (AP) — Republican Mitt Romney is stepping up for the most important speech of his life, to an audience of millions, after a rousing warm-up from a running mate who vowed the days of dodging painful budget choices will end if voters toss President Barack Obama from office. Having grasped the nomination on his second try, after years spent cultivating this moment, Romney will use his speech Thursday night to introduce himself to a large portion of voters and claw for advantage in a race that could scarcely be any closer. Romney hinted at the themes in a morning fundraising appeal emailed to supporters. "We believe in America, even though the last four years have been full of difficulties and disappointments, doubt and despair," Romney said. "We believe in America, even though President Obama's failed policies have left us with record high unemployment, lower take-home pay, and the weakest economy since the Great Depression." 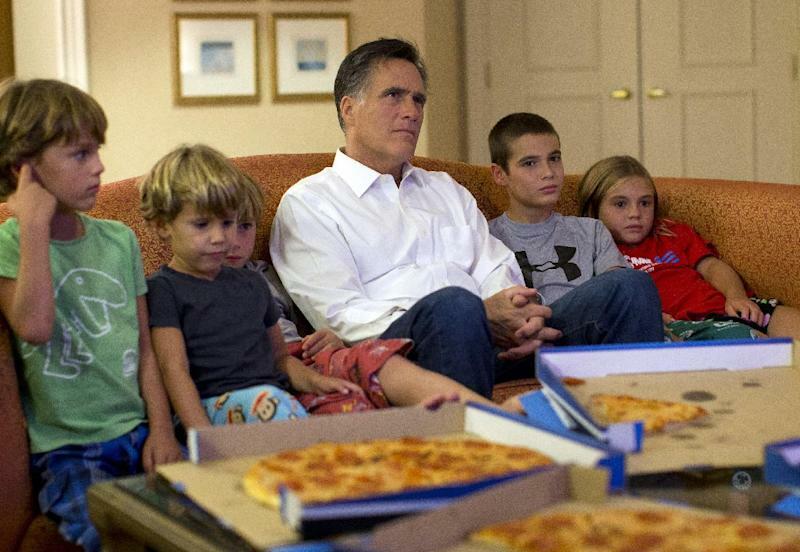 There was no shortage of advice for Romney from armchair speechwriters on all sides. Jeb Bush, the brother and son of former presidents, said it was critical for the normally reserved GOP nominee to connect with people on an emotional level — even if he's never going to be "a new-age kind of guy." "Where it matters is connecting with other people's concerns," Bush said in a round of morning talk show interviews. Only then, he said, will voters be ready to hear the candidate's case. Overnight convention planners transformed the convention stage, extending it about 12 feet to move the candidate closer to the audience. A glass barrier surrounded the bottom steps. 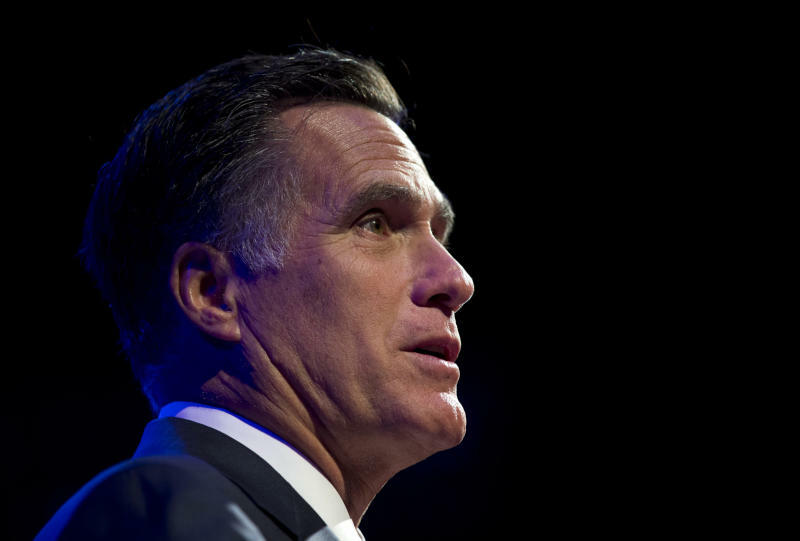 In a brief preview of Thursday night's speeches, Republican officials said members of the Mormon church, former business associates of Romney, including Staples President Tom Stemberg, and past Olympic athletes will help introduce the Republican candidate. As part of his introduction, Romney appeared prepared to discuss his Mormon faith in more direct terms than usual, a direction signaled by running mate Paul Ryan on Wednesday night in several allusions to the duo's differing religions but "same moral creed." The Wisconsin congressman, a deficit hawk who's become the party's darling since joining the ticket, offered a prime-time testimonial setting up Romney's turn on the stage in the Republican National Convention's finale. The Obama campaign was quick to pick apart Ryan's address, releasing a new Web video with a fact-check of what it said were inaccuracies in the congressman's criticisms of the president, and branding the GOP ticket wrong for the middle class. In the warm-up for Romney's speech, the Democrats also released a second Web video highlighting past criticisms of Romney on his record as Massachusetts governor and his budget priorities. After a two-day campaign tour through college towns, the president was staying out of the spotlight Thursday, ceding center stage to Romney. But in an interview with Time magazine released Thursday, Obama said he was hopeful for a more productive second term if re-elected, because "the American people will have made a decision. And, hopefully, that will impact how Republicans think about these problems." "My expectation is that there will be some popping of the blister after this election, because it will have been such a stark choice," Obama said. The president added that he needs to do a better job of communicating his goals to the American people — both during the campaign and what he hopes will be a future inaugural address and more State of the Union speeches. The interview was conducted last week. If history is a guide, viewership of Romney's speech — and Obama's address to his Democratic convention next week — will be surpassed only by the audience for their coming debates. The first night of the GOP convention drew an estimated 22.3 million TV viewers, the vast majority over 55. The Nielsen ratings company said that figure was down from the 23.1 million who watched the first full night of the 2008 convention, which nominated John McCain. Nielsen said just 1.5 million of those who watched Tuesday's convention session were in the 18-34 age group. The Republican convention's most rah-rah moments were unfolding as Hurricane Isaac, downgraded to a tropical storm, inflicted floodwaters and misery in rural stretches of nearby Gulf states. The slowly unfolding calamity went unmentioned by most key speakers Wednesday night, although a few asked for Red Cross donations for victims and offered prayers. The GOP had cut the convention's opening day in fear Isaac would strike Tampa, which was spared. Not that Obama set politicking aside for the week, either, even as he tended to emergency management. Locked in an unpredictable race that shows no clear advantage for either man, Obama on Wednesday implored young people in a crowd of 7,500 in Charlottesville, Va., home to the University of Virginia, to register, vote and make sure their friends do as well. "I need you," he said. "America needs you to close the gap between what is and what might be." Ryan, 42, came on board the campaign for the White House with a reputation in Washington for taking on the sacred cows in government spending, Medicare prime among them. He's also generated plenty of excitement among conservatives who have never been fully convinced that Romney is one of them. "I think he's a rock star for the Republicans," Allie Burgin, a delegate from Wynnewood, Okla., said before the speech. And that's how he was received on the stage. "The present administration has made its choices," Ryan said, "and Mitt Romney and I have made ours. Before the math and the momentum overwhelm us all, we are going to solve this nation's economic problems. And I'm going to level with you: We don't have much time." Ann Romney, in an interview with WTMJ-TV in Milwaukee taped before Ryan's speech, said Ryan and her husband are a "dynamic duo" who complement one another: "They're both very wonky when it comes to the intricacies of the budget ... You get the two of them together and they're like two pigs in slop." 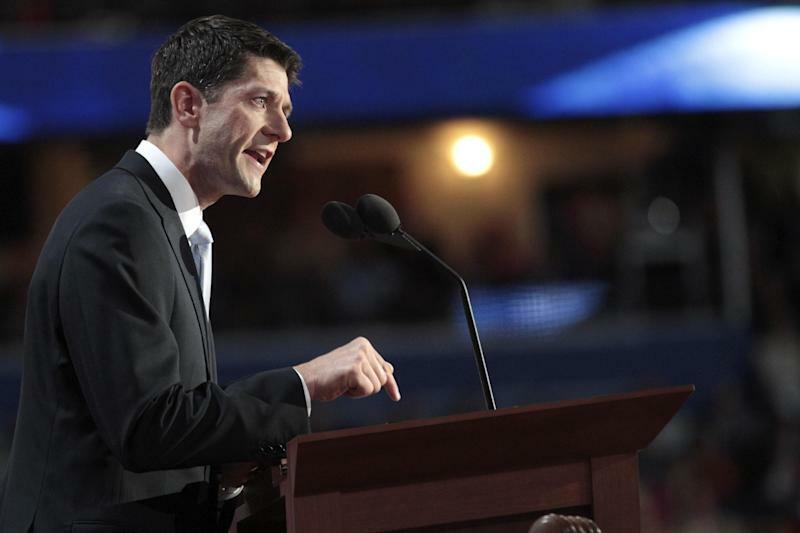 In his speech, Ryan was particularly cutting in his indictment of the president, even in a convention loaded with anti-Obama rhetoric. "Fear and division are all they've got left," he said. "It all started off with stirring speeches, Greek columns, the thrill of something new. Now all that's left is a presidency adrift, surviving on slogans that already seem tired, grasping at a moment that has already passed." Ryan misrepresented Obama's record at times — and seemed to forget his own. He said sharply that "the biggest, coldest power play of all in Obamacare came at the expense of the elderly. ... So they just took it all away from Medicare. Seven hundred and sixteen billion dollars, funneled out of Medicare by President Obama." In fact, Ryan himself incorporated the same cuts into budgets he steered through the House in the past two years as chairman of its Budget Committee, using the money for deficit reduction. The cuts do not affect Medicare recipients directly, but rather reduce payments to hospitals, health insurance plans and other service providers. Moreover, Ryan's own plan to remake Medicare would squeeze the program's spending even more than the changes Obama made. In a letter sent Thursday morning to potential Democratic donors, Obama campaign manager Jim Messina said Ryan's speech "represents a huge bet by the Romney campaign — they've decided that facts, truth and reality will not be a brake on their campaign message." Romney spokesman Kevin Madden said days earlier that the nominee would discuss his Mormon religion in his convention address as part of "what's informed his values." Ryan, a Roman Catholic, took up the matter conspicuously, and no doubt as part of the convention's carefully crafted message. "Mitt and I also go to different churches," he said. "But in any church, the best kind of preaching is done by example. And I've been watching that example. The man who will accept your nomination tomorrow is prayerful and faithful and honorable." And again: "Our different faiths come together in the same moral creed. We believe that in every life there is goodness; for every person, there is hope. Each one of us was made for a reason, bearing the image and likeness of the Lord of Life." Obama, asked in the Time interview what he admired about Romney, said the GOP nominee "seems to walk the walk and not just be talking the talk when it comes to his participation in his church." Woodward reported from Washington. Associated Press writers Steve Peoples in Indianapolis, Julie Pace in Charlottesville, Va., Jim Kuhnhenn in Washington and Philip Elliott, Beth Fouhy, Tamara Lush and Elizabeth Bunn in Tampa, Fla., contributed to this report.